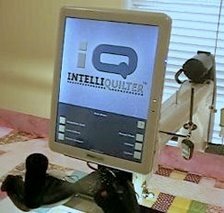 This is a tutorial of how to do trapunto on the Intelliquilter. Click here to download pdf tutorial. Shirley shows how to transfer patterns from her PC to IQ. The first video uses Windows XP, the second Vista. Since the latest version of our software, we are seeing a few screens we had not seen in the previous versions. 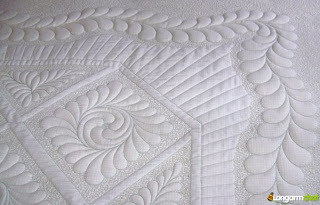 In the previous versions we set up our thresholds in the preferences area, prior to setting up any quilts or blocks. In this newer version we are forced to make this decision during our set-up. 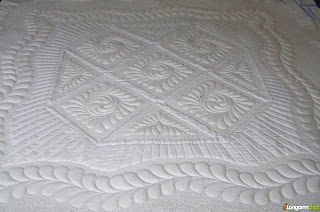 Many of us (myself included) never really needed to know what this all meant before we had the no sew and clipping blocks. I usually trained my customers on this briefly in the preferences area, but rarely was it ever changed. Now, we need to pay closer attention to these settings. Understanding them clearly is the key to successful stitch-outs. To read more of this article please click here to download the entire illustrated document. This video shows how you can change the start/end point of a motif with the touch of a button. I use one of Kathy Olson's patterns in this video as an example of how IQ can sometimes randomly select where the start/end point will be. The odd placement of the start/end point was not Kathy's choice, but rather a result of IQ converting a pattern originally digitized for another system. The pattern stitches out beautifully. A little explanation of the speed and detail settings and how they work together with the speed setting on your machine. This also shows what happens when you have the speed set too fast. Shows how to create and save a block from a pattern. This shows how to use clipping block to trim echoes that extend beyond the edge of a block.